Oxford instruments NanoScience, the provider of market-leading research tools, recently announced that it has achieved ISO 9001:2015 certification. NanoScience has been registered and certified with the ISO 9001 Quality Management System standard since 1994. As a leader in the industry, this latest certification further distinguishes the quality of NanoScience products and services that will help the company maintain its competitive edge. ISO 9001 has been revised several times and NanoScience has always promptly and effectively made the necessary changes to its Quality Management System, ensuring compliance with the latest standards. ISO 9001:2015 is the newest update, which provides an integrated approach to quality management and continual improvement, helping businesses to monitor and manage quality across all operations. The trend is moving towards more complex global supply chains that demand integrated action. This new version is aimed to keep up with these expectations. Acquiring this certification demonstrates that NanoScience is committed to meeting customer needs in a way that is measurable, and increases customer satisfaction. 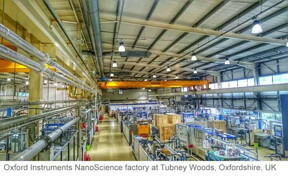 “We are committed to delivering high quality products and a high level of service at all times by making continuous improvement in our systems or processes”, commented Dr Michael Cuthbert, the Managing Director of Oxford Instruments NanoScience. “We have always been proactive in anticipating the market demands and our customers have complete confidence that our products are designed, manufactured and tested to the highest standards”, added Dr Cuthbert.